Nothing says summer like an ice cold popsicle! And these fruit popsicles are easy to make, healthy, refreshing & chock full of delicious sweet fruit! Place watermelon into blender, puree & set aside. 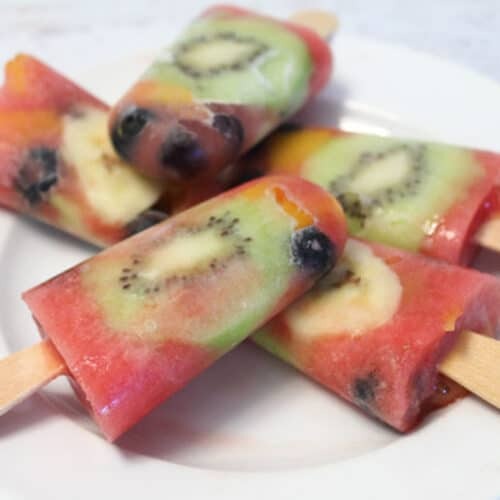 Place 2 slices each of banana, peach, & kiwi into a popsicle mold, followed by some blueberries. Use popsicle stick to mix fruit together and push against the mold walls. Fill molds with watermelon puree, add sticks, and freeze. To remove popsicles, run hot water over outside of mold until loosened.